This article focuses on the likely top market drivers for US and global asset markets in the coming week, mostly fundamentals drivers, but also includes an overview of the global technical picture – and a very intriguing setup for US equity bulls who like to buy on the dips within strong entrenched uptrends. The lesson looks like it applies in Asia, though I’m less certain about the resilience of the uptrend for European stocks. See the “Technical Picture” section at the end of this article. Yes, yes, the Fed rate statement and press conference is the likely top market mover this week. Surprise (not)! The FOMC meeting has the most near term market moving potential of any calendar event next week, given that markets have been moving mostly on taper speculation for the past weeks. If the mere rumors were the prime market mover, then the actual news should be bigger, right? Not necessarily. As always, the impact depends on how much the event surprises markets for good or bad, and thus changes perceptions about various asset values, forcing some assets to rally and others to sell off. In other words, it’s always all about how much the event surprises markets and changes future expectations. The degree of ‘surprise’ will depend on how markets interpret both the Fed’s decision and whatever forward guidance it offers. Indeed, a clear statement about future intentions could be more important than any actual choices the Fed announces. If the Fed doesn’t taper, and there is no clear forward guidance, markets will likely show some kind of relief rally – stocks and other risk assets up, USD down, and so currency hedges and other instruments that tend to move opposite the USD, like gold and the EUR, go up. If however the Fed signals the taper will start in January, then these moves would be limited or non-existent if the Fed hints that the taper will be small (around 10%, $8.5 bln). Any hint that it will be substantial, or that the Fed intends to increase the pace of the taper, would produce the opposite effect, with the USD soaring, and stocks diving. We strongly suspect, as noted in the past here, that they will want to preserve Ms. Yellin’s freedom of action. Thus the likely response is either to do nothing and say that they’ll decide depending on more data – OR, to announce a very small token taper, with the proviso that they could alter the pace or halt the taper depending on how US data plays out. In sum, we don’t see the FOMC meeting and press conference generating huge market moves. If anything, we expect the usual subdued price action or mild sell offs early in the week that so often proceed major risk events. That said the FOMC meeting has the most market moving potential, in the near term, of any scheduled event next week, given how mere rumor and speculation on the taper have been the prime market driver in recent weeks. Other Fed action next week includes an expected confirmation of Janet Yellin as new Fed Chairwoman/person. It’s expected, so we don’t expect any price movement unless she isn’t approved, or says something very surprising in her acceptance comments. As we discussed in depth in our 3 part series just posted Sunday, the actual biggest story with the most overall market moving potential is the coming week’s attempt in the EU to finalize the single resolution mechanism (SRM – get to know this acronym), a detailed plan for how to deal with and fund troubled EU banks (see December’s Real Top Event – By Far – Happens This Week: Part 1, and introduction with key background and themes for those not familiar with it, and it has links to Part 2 (key terms with commentary) and Part 3 (summary and conclusions). I spent most of last week researching and thinking about this one, because the issue is complex and has many moving parts. Yet through all that, one sees the same themes and behavior patterns that have dogged the EU crisis coming through yet again. Nothing has been fixed in the EU. Since the summer of 2012, quiet has been maintained by a combination of lending money to the insolvent in order to delay the ultimate day of reckoning, sheer spin control, and pressure to keep quiet during US and German elections. The SRM is the EU’s first real attempt to begin fixing its banking system so that insolvent banks can no longer threaten to drag down entire nations, banking systems, and perhaps the EU, along with them. Remember that EU members don’t have the very useful option of printing money in emergencies. So EU sovereign states and their banks are much more likely to become insolvent as long as there remains no reliable emergency lender of last resort that has the cash and can deploy it quickly enough to prevent a single bank insolvency from spreading doubt about other banks, which in turn casts doubt on other banks and the loss of confidence, and credit, spreads like a plague (hence the term “contagion risk”). An independent, central banking supervisor for all EU banks that, in theory (again) is independent of the political pressures that national regulators face to “preserve stability/confidence/national pride,” which often translates into outright lying and cover-ups of troubled banks for as long as possible. Before the Brussels takes responsibility for EU banks, the ECB must first do a rigorous stress test to uncover any bad banks before they get stuck with the cleanup bill. Before there can be any stress tests, there must first be both a clear plan backed by a fund large enough to easily cover the costs of recapitalizing or closing banks that fail the stress tests. The SRM is to provide that plan and funding. If there is no well-planned and well-funded SRM, there can’t be any CREDIBLE, RIGOROUS bank stress tests, because uncovering bad banks without a safety net would only risk inviting a new EU crisis. This is the precise reason that past EU bank stress tests were widely suspected of being mere PR exercises. They were then proven to be when banks that passed the test failed with months and brought new bank bailouts. For example, Dexia, Bankia, and Liaki banks all passed the last tests in 2011. See Part 1 of our full special feature for details). If this first attempt at substantive reforms and repair of the EU fails, or is even significantly delayed, then all kinds of bad things could happen, and at least some of them will. The EU again loses credibility by showing it can’t deal with fundamental, existential threats and reforms. Unlike Washington or Japan, which have had their issues too, the EU doesn’t have the luxury of time that a functioning, integrated banking and financial system provide. That disappointment might prompt a brief selloff, but EU goofs don’t pack much surprise power, and markets are accustomed to not seeing substantive action until crises hit. At some point we get a new EU crisis. Markets have become inured to them and so they are no longer as quick to sell off. But if too-big-to-fail-or-bail nations like Spain or Italy hit a banking crisis that threatens their own solvency, then it’s either financial collapse in the EU or lots of money printing. EU: Flash manufacturing and services PMI for France, Germany, and the EU. ECB President Draghi speaks and may offer insights into ECB policy or the SRM negotiations. EU: German Ifo survey: like the ZEW it’s an important sentiment survey from the one relatively prosperous economy that’s big enough to pay the largest portion of EU common expenses. The ZEW focuses on institutional investors, whereas the Ifo surveys manufacturers, wholesalers and retailers. US: The FOMC rate statement, press conference. The latest update on Fed taper timing, pace, and what influences their thinking. We might have extended SRM negotiation as they did last week. As we note in our special report, the big near term risk is that markets realize the SRM deal doesn’t provide enough centralized control or funding and so produces a selloff. However markets are used to the EU deferring hard decisions until crises, so the more likely response is a rally IF they get any kind of finalized deal. There’s also a Spain 10 year bond auction. These have become non-events in the prevailing EU calm and/or EU stage managing of these events. However if the SRM deal goes wrong or right, we might see a reaction here that could be revealing, even if only to tell us what message the EU wants to send. Here’s our sample of weekly charts from 9 leading US, European, and Asian indexes, which we use to get an overall picture of stock and risk appetite trends. The S&P 500 chart has a variety of additional indicators: 10-200 week EMAs, double Bollinger bands, to help us use it as an overall market barometer. 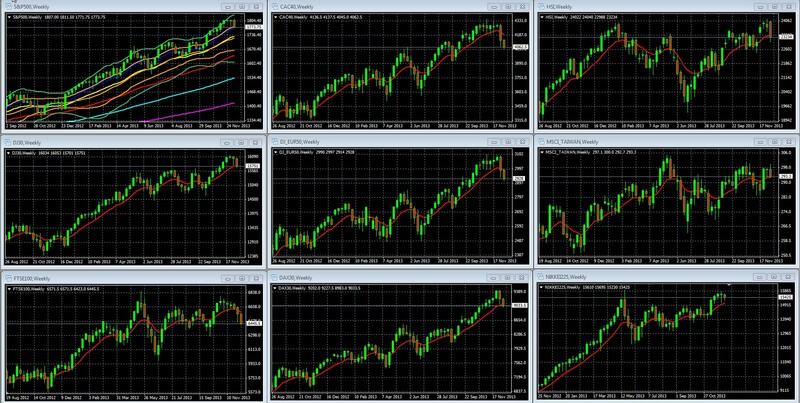 WEEKLY CHARTS OF LARGE CAP GLOBAL INDEXES WITH 10 WEEK/200 DAY EMA: LEFT COLUMN TOP TO BOTTOM: S&P 500, DJ 30, FTSE 100, MIDDLE: CAC 40, DJ EUR 50, DAX 30, RIGHT: HANG SENG, MSCI TAIWAN, NIKKEI 225 NB: The S&P 500 chart has a variety of additional indicators: 10-200 week EMAs, double Bollinger bands, to help us use it as an overall market barometer. Everything pulling back, supposedly on fears of an early fed taper, or guidance on one, removes what’s believed to be the primary driver of the rally in stocks and other risk assets. Europe began pulling back a week earlier than the US. Looking at the S&P 500 chart, we note that the US stopped rising 4 weeks ago and flashed 2 straight weeks of doji shape candles prior to this week’s pullback, reflecting indecision. That said, the pullback in the S&P 500 is only to its 10 week support around 1770. That’s just a normal pullback within an overall uptrend, and it remains within the buy zone (upper quarter) of its double Bollinger bands, which tells us the upward momentum is still there. If the balance of your evidence suggests that the rally is intact,(and mine does) this 1770 area is an excellent entry point for new long positions (aka a buy point) as the index has pulled back to the bottom of its buy zone but not broken below it. Your entry risk here is low because if price breaks below this support area (comprised of the bottom of the double Bollinger band buy zone (top orange line) and the 10 week EMA (blue), then you know support has not held and you can exit with a very small loss because you entered near or at this support. The continued layered rising EMAs (shorter term10 week EMA (blue) on top, followed by 20 week EMAs (yellow), 50 (red), 100 (light blue) 200 (violet) are an additional bullish technical indicator of entrenched upward momentum. 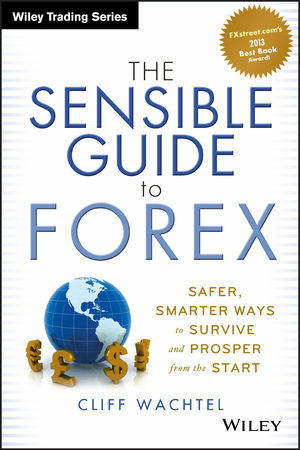 For a comprehensive, clear introduction to risk management tools such as identifying low risk entry points, see my book, chapters 3-5 for the basics of technical analysis and risk and money management (RAMM), and chapter 7 for trade examples that demonstrate how we apply these principles to keep losses low relative to our gains, so that we can be very profitable with a winning trade percentage of under 50%. If you’re not familiar with how to apply and interpret double Bollinger bands, see: 4 RULES FOR USING THE MOST USEFUL TECHNICAL INDICATOR, DOUBLE BOLLINGER BANDS. For those seeking a lighter introduction to technical analysis, currencies and to how to build currency-diversified income streams, here’s something for you too. For the second time since its publishing, I’m proud to announce a new introduction to forex video course, this one just released by FX Academy, based in part on my award winning book. It’s still being offered for free during the launch period. So if you ever wanted a simple no cost video intro to forex, this is your chance. See here for details.